A Wildlife Protection System using state-of-the-art technology was tested during 2002 and 2003 on Highway 93 in Kootenay National Park in British Columbia. The technology is designed to alert approaching drivers with "real time" information of the presence of wildlife on the road. 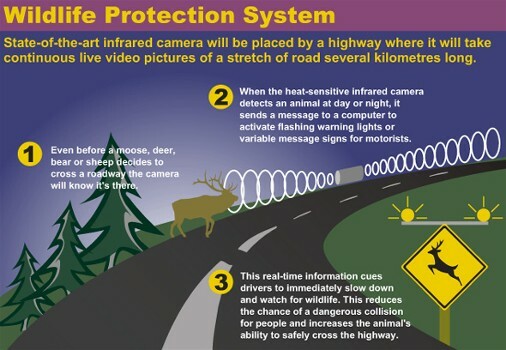 The system uses infrared (heat sensing) cameras to detect the presence of wildlife on or near the roadway. When the cameras detect wildlife, flashing lights at both ends of the road segment are triggered. This "real time" warning cues drivers to reduce speed and anticipate wildlife on the road. Click the play button to see actual footage of the Wildlife Protection System. Video clip [WMV - 794 KB]provided courtesy of Sylvan Consulting Ltd. If pressing play does not start the movie, go to the Windows Download Centre for free access to Windows Media Player. The infrared QWIP technology used in 2002 was originally developed by the NASA Jet Propulsion Laboratory, and has been used to assist satellites with space-based programs and other military applications. The high resolution QWIP technology can detect a heat difference of 1/100th of a degree Celsius. Trials in 2003 incorporated FLIR cameras, which have a range of up to 800 metres. The cameras can "see" through darkness, and, to some degree, through rain, fog, and smoke, and can interpret patterns of thermal gradients and movements to differentiate between wildlife and other heat sources. Trials in 2002 recorded deer behaviour over continuous 24-hour periods, and the results provided researchers with accurate information regarding deer risk behaviours. View the report on the Reports page. Wildlife cannot become habituated as they do to scents, reflectors, and other deterrents because the system focuses on the actions of motorists, rather than animal behavior. Drivers are less likely to become complacent to the warning system because it is only triggered temporarily when wildlife is present. This system does not interfere with the natural movement of wildlife, nor require the construction of overpasses or underpasses to allow for highway crossings. Another benefit is the system's capability to collect video footage, allowing researchers to record and study wildlife numbers and behaviour on a 24-hour basis. This new technology could be incorporated with other mitigation methods to reduce wildlife-vehicle collisions, thereby making highways safer for both the public and wildlife populations. Additional research and field testing is required before the Wildlife Protection System is commercially available. Rainbow Group of Companies Inc.